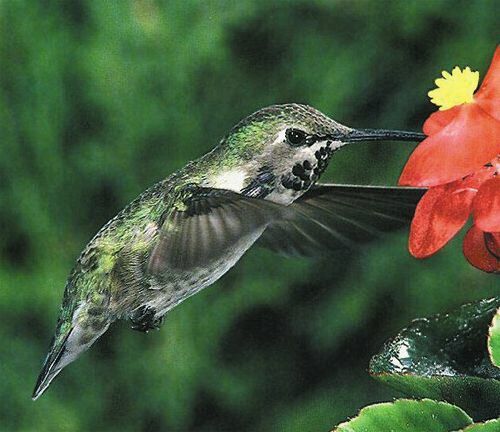 Costa's Hummingbird, Calypte costae, is a small (3") hummingbird that occurs in the western U.S. (primarily coastal) and Mexico, but is known to wander eastward (see U.S. Hummingbirds by State). Field Marks: Adult male has metallic green back, sides, and belly; and iridescent purple crown & gorget; feathers on side of throat extend backwatds along neck; tail is dark. Females are larger, with green crown and back, white belly & breast, buffy flanks, and white-tipped outer tail feathers; throat often has one or more dark feathers. Immatures resemble females. Bill is long and straight. 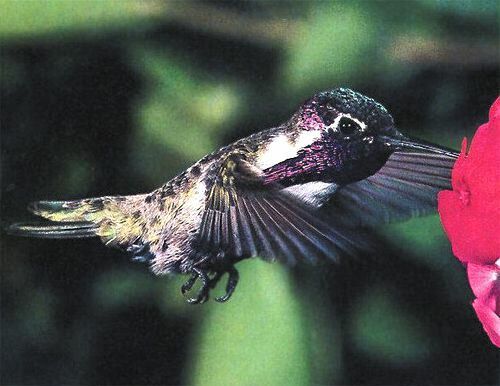 If you have a sharp photo of a Costa's Hummingbird you would like to contribute for this page, please send it to PROJECTS with info about when and where the photo was taken, the photographer's name, and any anectdotal info about the bird.